WALNUT, CA- Super star students and parent volunteers from Collegewood and Westhoff Elementary Schools were honored by the Walnut Valley USD Board of Trustees during the April 18 meeting. In addition, the Board recognized 15 talented young artists named winners in the 2018 Music K-8 Magazine Cover Contest. 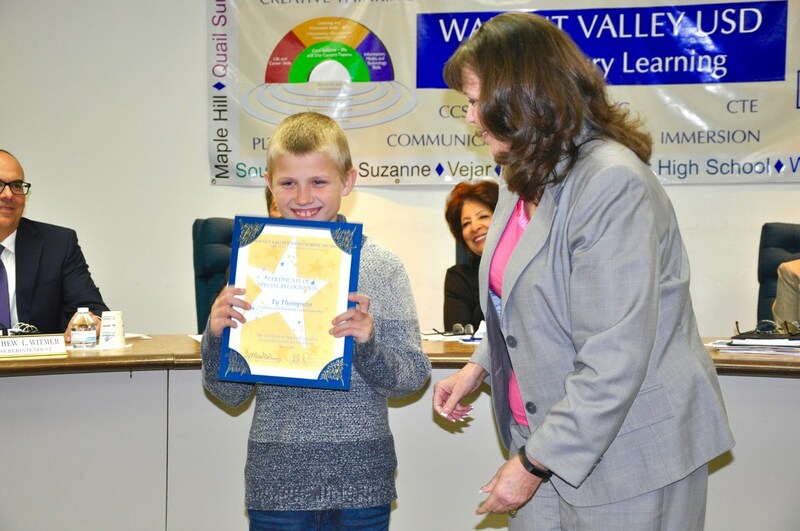 Collegewood Elementary third grader Ty Thompson was celebrated with the Super Star Student Award for demonstrating extraordinary character each and every day. 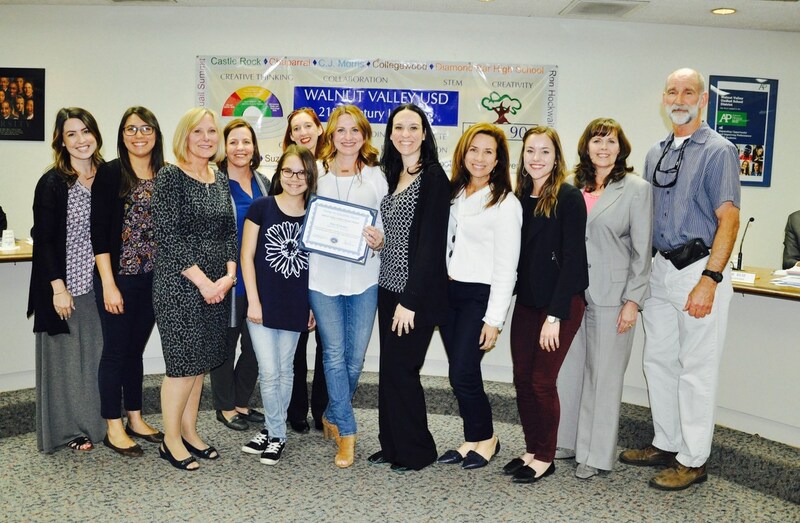 All our Walnut Valley schools are deliberate about the development of academic excellence and building children’s capacity for compassion and kindness, said Principal Dr. Mary Wendland. Ty is always quick to reach out his hand in friendship to classmates. This year, his class served as “big buddies” to transitional kindergarten students. “Ty works to make our school a kinder and gentler place for kids and adults. And he will undoubtedly continue to make a positive impact to the people around him!” Dr. Wendland added. Dedicated parent volunteer Dora Cuellar received the Partner in Education Award. “Dora is a touchstone for our school and serves students and staff with endless enthusiasm,” Dr. Wendland said. Dora has served in the Community Club by organizing fundraisers, helping with the annual Carnival, Jog-a-thon, and providing child care during family education events. She is always willing to step in and help and never hesitates to go “eye-to-eye” with a child to give a little encouragement. “Dora serves with an open heart and we are truly grateful for the countless hours she gives to make our school a great place to be!” Dr. Wendland said. 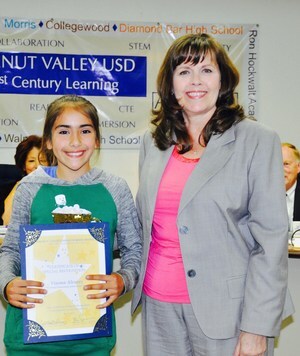 Westhoff Elementary fifth grader Vianna Alvarez is an exemplary Wrangler who is kind with an enormous capacity to share with others and gives 100% in all that she does, said Principal Denise Rendon. She was honored with the Super Star Student Award. Vianna is a longtime soccer player whose dedication to being an athlete has helped her set goals and attain them both on and off the field. She is also a dedicated member of Student Council leadership who is always eager to volunteer when needed. “Vianna is a positive and joyful young lady. She has one-of-a-kind enthusiasm that brings out the best in others!” Rendon added. 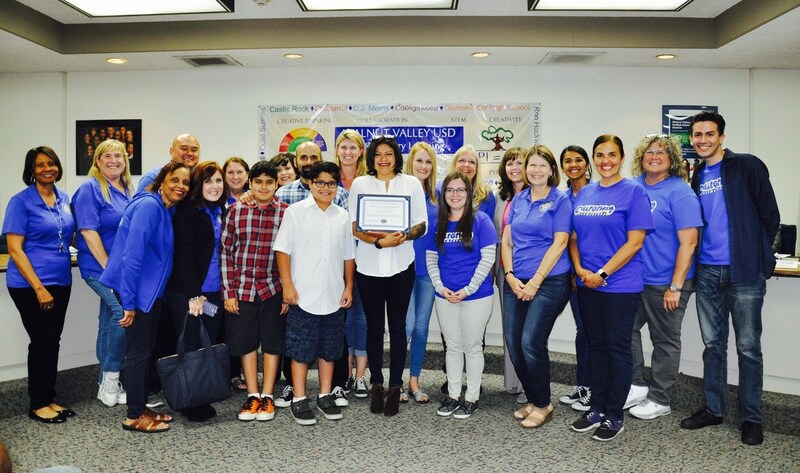 Longtime parent volunteer Amy Kawata was recognized for 15 years of service with the Partner in Education Award. “Amy has played an important role at Westhoff, long before she was a Westhoff parent!” Rendon said. She is selfless, gracious, and willing to help with anything she is asked to do. Amy is trusted and heavily committed to helping the school plan for grade level and schoolwide activities. “Her strong networking skills allow her to keep a thumb on pulse of the school community and help communicate information to parents,” Rendon said. Fifteen elementary students were recognized as winners in the international 2018 Music K-8 Magazine Cover Contest. 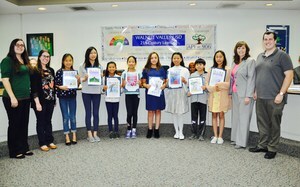 Vocal music teacher Greta Davis introduced the talented 5th grade artists who received certificates of recognition and color prints of their original designs. 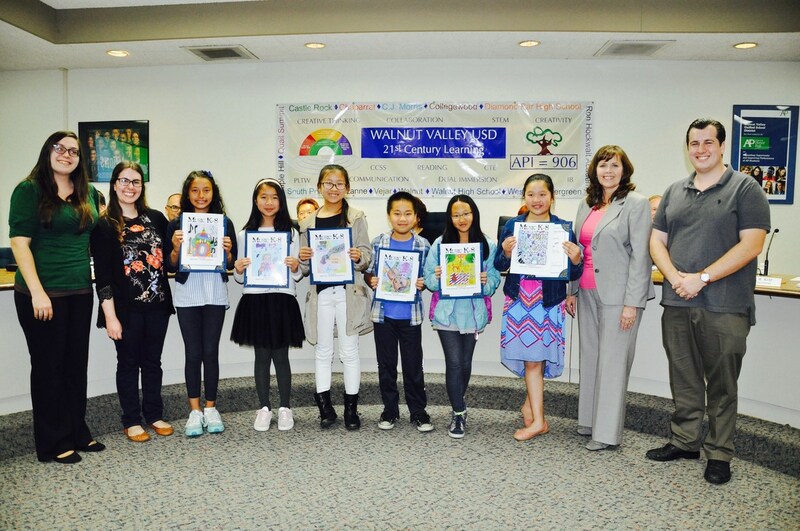 Three WVUSD students received top awards: Hailey Chan, C.J. Morris - 1st Runner -Up, Nicha Chaisakulchai, Quail Summit – 3rd Runner Up, and Ariel Shan, Maple Hill - 5th Runner-Up. 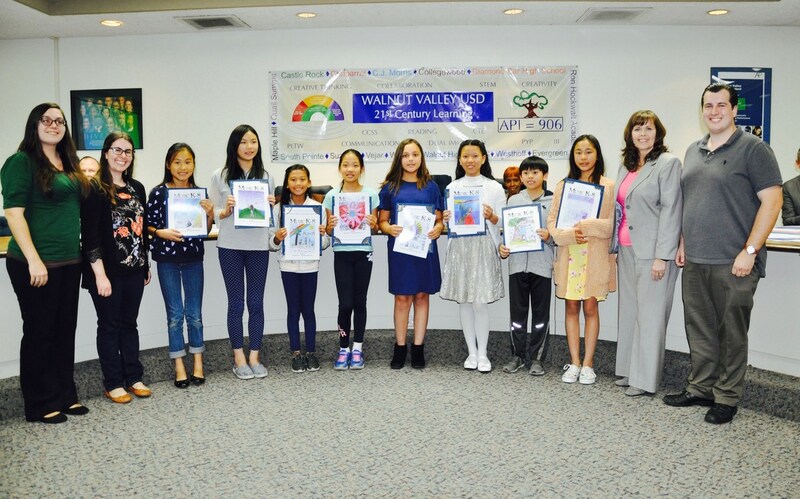 Top Finalists are Sophia Ibarra – Collegewood, Abigail Huang – Vejar, Angelina Wu – Quail Summit, and Eddie Zhang – C.J. Morris. Finalists are Natalie Dai, Christine Liu – Quail Summit, Shylah Magno – C.J. Morris, Sanny Yang, Rachael Yang – Walnut El, and Chloe Bella Syrett – Westhoff. Honorable Mentions are Aidan Chen and Evelyn Nakaishi – Quail Summit. 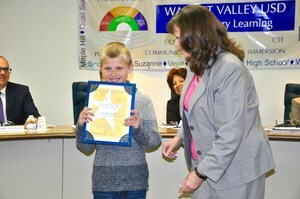 Collegewood Elementary third grader Ty Thompson receives the Super Star Student Award. Shown with Board President Cindy Ruiz. Shown with family and staff members. 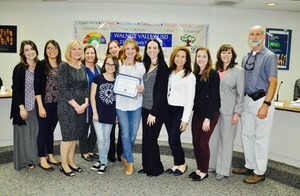 Collegewood Elementary parent volunteer Dora Cuellar is honored with Partner in Education Award on April 18. 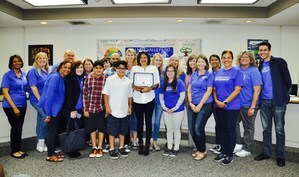 Shown with Board President Cindy Ruiz, family and staff members. 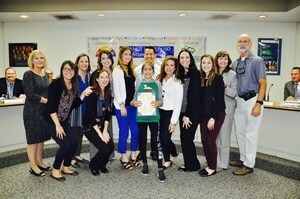 Westhoff Elementary fifth grader Vianna Alvarez receives Super Star Student Award. Shown with Board President Cindy Ruiz. Shown with staff members. 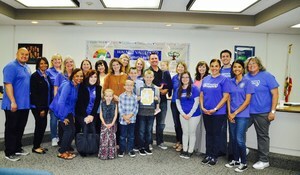 Westhoff Elementary parent volunteer Amy Kawata honored with Partner in Education Award. 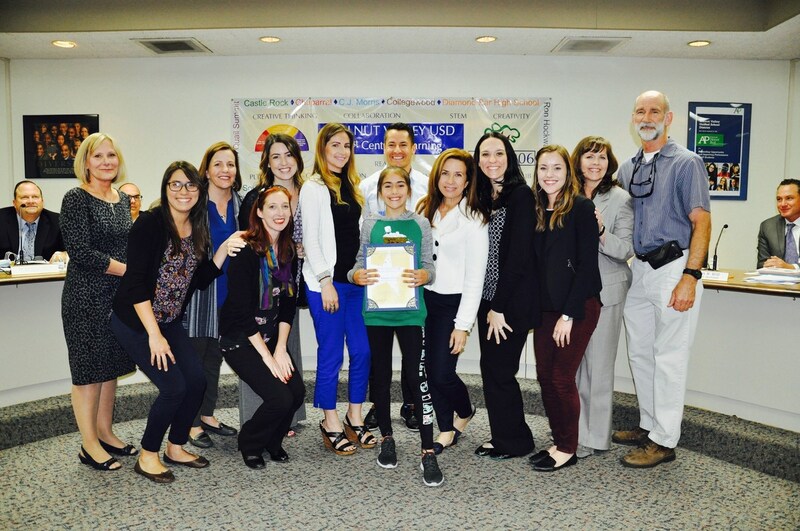 Shown with Board President Cindy Ruiz, Principal Denise Rendon, and staff members. Fifteen elementary students honored as winners of the Music K-8 Magazine Cover Contest. Shown with music teachers and Board President Cindy Ruiz. C.J. 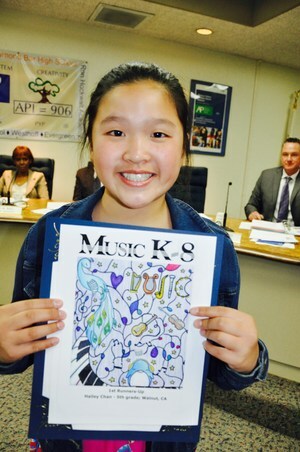 Morris Elementary 5th grader Hailey Chan is the 1st Runner-Up winner in the 2018 Music K-8 Magazine Cover Contest. Her original artwork is featured in the magazine.